NOTE: HubSpot is currently updating its content editor and this guide is for using the old way of doing it. If you want help using the new editor check out this post for creating global modules and this one for how to edit them. Downloading a HubSpot COS template is exciting! In general, these templates are very easy and intuitive to use. Click here to add content, type there to build a blog post, upload here to add an image... however not everything about the COS is as obvious as it could be. This blog post will take a look at Global Modules, why they're beneficial, and how to use them in your COS site. What is a Global Module and why should I use them? Global Modules are groups of modules that can be re-used throughout your website. A great example of a Global Module is your site header. Say you download the template and adjust your site header to be just as you want it. Beautiful! Perfect! And now on to an Interior Page... except wait one moment! Your header on the Interior Page is still the straight-out-of-the-box variety, not that glorious header your so carefully designed on the homepage. By grouping those header elements on your homepage and saving them as a global module, you can add them with the click of a button to any other page on your site. This keeps your website professional, consistent, and easy to manage. Global modules allow you to ensure that your website is consistent on every page. Additionally, they automatically update with every page. Say you change your site header to include a link to your company's Twitter feed. Rather than going through and editing that link into every single page on your website, you can simply update the Global Module to include this link, and ta-da! All your pages are still identical, and now they feature your Twitter account. So by now you must be saying, "Okay, but how do I create a Global Group in HubSpot?" Easy! Just watch the video below to learn how to build and use Global Group Modules in the HubSpot COS. Looking for information on how to edit your global groups with the HubSpot Content Optimization System? Don't worry: we've got you covered for that too. 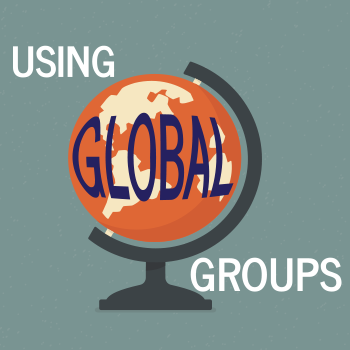 Ready to get started with your own global groups? Check out our HubSpot Templates to start working within the COS yourself!